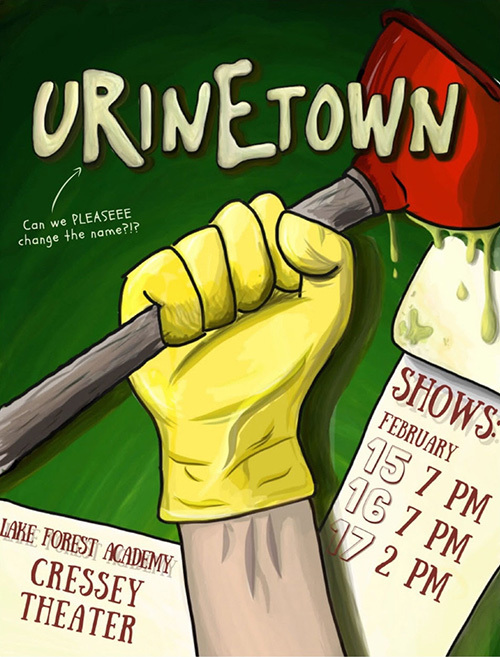 This year's Winter Musical was Urinetown, a satirical comedy by Marc Hollmann and Greg Kotis. Performances took place on Thursday, February 15 and Friday, February 16 at 7 p.m., with a final showing on Saturday, February 17 at 2 p.m. in The Cressey Center for the Arts. What is Urinetown? Urinetown is an offbeat 2001 Broadway musical which won the Tony Awards for both Best Book and Best Score, and which has since become a staple of high school musical theatre. Importantly for us, Urinetown is an opportunity for an ensemble-forward show filled with classic musical styles and references, but with a contemporary sense of humor that resonates with the cast and crew. The book and lyrics are by Marc Hollmann and Greg Kotis. LFA's Theater Director and Instructor, Matt Boresi is the Musical Director. Director of Music Timothy Plambeck directs the musical performances and Production Manager Jason Koenig leads the Scenic Design and Technical Direction teams.